Why does the Basque Country seem so quiet about independence nowadays? Considering the nationalist surge in Catalonia, Scotland and other European regions, why does the formerly restive Basque Country seem so quiet about independence? 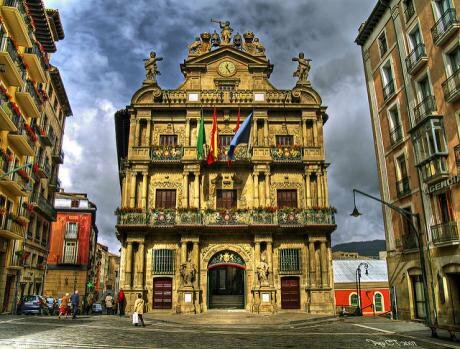 Pamplona, "Hemingway’s and other San Fermin lovers’ delight". Flickr/Paco CT. Creative commons.Basque nationalism has never held more institutional power. Together, the Basque moderate nationalist party (PNV) and the pro-independence left (Bildu, “Unite”) hold 60% of the vote and 64% of the seats (48/75) at the Parliament of the Basque Country. Navarre, which constitutes a separate administrative region but lies at the core of the Basque motherland in the nationalist narrative, is now ruled by a coalition comprised by a pro-Basque party (Geroa Bai, “Yes to the future”), Bildu and the rather small Spanish Izquierda Unida (“United Left”). Nationalism is in command in all three provincial governments, the three main Basque cities, Pamplona (Hemingway’s and other San Fermin lovers’ delight), and the vast majority of towns in the region. Considering the nationalist surge in Catalonia and elsewhere in Europe (Scotland, Belgium, Corsica…), why does the Basque Country seem so quiet about independence? I believe this is due to three main factors, one institutional, one historical and one strategic, and that there is a common thread through all three of them: the economic crisis. The institutional factor is a very unique tax system, known as “economic concert/covenant”, recognised in the Constitution of 1978. The Basque Country and Navarre are the only two regions that collect their own taxes and transfer a portion of them to the Spanish Treasury. The percentage (“cupo”) is negotiated between Spain and the Basque Country and Navarre separately, and it is greater than their share of population or GDP. Handling their own taxes gives them a level of economic autonomy far greater than that enjoyed by Catalan authorities. The economic concert has also served to reduce notably the width and depth of austerity policies applied elsewhere. This tax system enjoys wide support across the Basque political spectrum, both on the right and the left, among nationalist and non-nationalist parties. However, in the context of the economic crisis and austerity, in the rest of Spain a rising number of voices within the conservative PP, the social-democratic PSOE and the centre-liberal Ciudadanos are denouncing the economic concert as some sort of unfair privilege. As important as institutions are, one should not ignore where we are coming from. Damaged by social rejection, police action and political ineffectiveness, ETA put an end to its four decades of killings and threats in October 2011. After a long delay, the pro-independence left, a good chunk of which refused to condemn ETA’s action while it was active, recently started “to acknowledge the harm they caused”, in their own words. In the meantime, hundreds of ETA prisoners keep serving their sentences scattered around Spain and France far away from their families, while Spain has not implemented human rights recommendations from the UN and the Council of Europe related to torture in the fight against terrorism. The Basque Country is still learning to lick its wounds, look after the victims and build the necessary bridges to foster social reconciliation. A great deal of audacity and generosity is required, and independence would be a highly divisive issue in a society in need of appeasement. Besides, the economic crisis gave media and the Basque people something at least as important to worry about. The third factor I want to talk about is the strategic choice made by the moderate nationalism since it got back to power nearly four years ago. PSOE had been in the Basque government for three years, with PP’s parliamentary support. In 2012, ETA’s endgame boosted a refreshed pro-independence left back into institutions, but PNV remained the largest party. Daunted by recession and unemployment (which never reached the numbers seen elsewhere in Spain), the newly appointed First Minister, Iñigo Urkullu, from PNV, made the clear choice of attempting to rebuild the economy before building the nation. With this agenda in mind, PNV felt that PSOE was a more reliable ally than Bildu. The Spanish social democrats now support PNV’s regional government, and both parties share power in the three provincial governments and many municipalities. Institutions, historical background and political strategy hide behind the independent elephant in the Basque room. That said, the storyline may very well change. Ciudadanos is essentially nonexistent in the Basque Country, PP has reached historical lows and PSOE is struggling to keep its place. Moreover, one should not forget that in 2003, another PNV figure, former First Minister Juan Jose Ibarretxe, came up with a plan to turn the Basque Country into a state “freely associated” with Spain. That plan came to nothing in the end, but ETA is not an obstacle anymore, and the European spectrum of centrifugal nationalism may carry this wave back to the Basque coastline. Whether “they can” resurrect the pro-independence agenda will very much be shaped by “We can” (Podemos). Somehow unexpectedly, Podemos received the largest share of Basque votes in the Spanish election last December. PNV has publicly said that they want to see a coalition between PSOE and Podemos in Madrid, but nationalists and pro-independence leftists must secretly fear that Podemos could steal their votes in the Basque elections next autumn. Although it does not support independence, Podemos is in favour of a referendum and its territorial policy is much less centripetal than that of PP, Ciudadanos or even PSOE. On the other hand, it is at least questionable whether Podemos’s manifesto offers anything radically new to Basque politics. No corruption scandals have burst out, and with 4.5% of the population, the region encompasses 40% of all the welfare spending in the whole of Spain. Bildu did not perform well in December, losing 5 of its 7 MPs in Madrid, but the Spanish Parliament is not one of Bildu’s priorities. Furthermore, they believe to have an ace up their sleeve. Their best-known historical leader, Arnaldo Otegi, will be released in March, after serving more than six years in prison for “being part of ETA”. It is widely admitted that Otegi was instrumental in ETA’s decision to declare a permanent ceasefire in 2011. Bildu will try to nominate him as their leading candidate in the election later this year, a likely decision of very uncertain outcome. A special tax regime has granted Basque institutions a level or autonomy hardly comparable elsewhere in Europe. Basque society is still getting back to normal after decades of terrorism and social division. And political leaders made a deliberate choice for stability and economic recovery in a context of socioeconomic crisis. The scenario may change, of course, but political forces will face a number of challenges. The ongoing negotiations to conform the Spanish government and the Basque elections later this year will shed light on what the future holds.